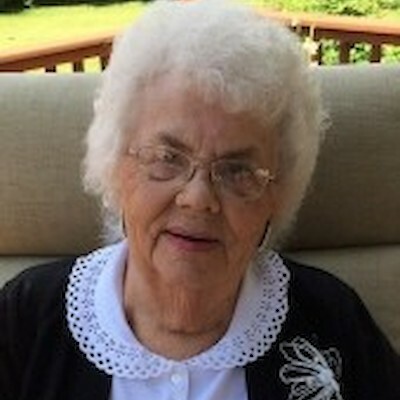 Dorothy Sorensen, age 90, a resident of United Pioneer Home in Luck, went home to be with the Lord on April 9, 2019 with her family by her side. She was born on June 27, 1928 to parents, Uffa and Edith (Berg) Jensen. She attended school in Osceola and Luck, Wisconsin. On November 8, 1952 she married Alfred C. Sorensen. Together, they were active members of the VFW and Dorothy served proudly as a member of the VFW Auxiliary, American Legion Auxiliary and DAV Auxiliary. Dorothy worked in food service for a time but spent the majority of her adult life as a homemaker caring for and providing for her family. Dorothy enjoyed bowling, dancing, traveling, shopping and tending to her houseplants and flower gardens. Most treasured was her time spent with family, as a devoted mother, grandmother and great-grandmother. She always had freshly baked cookies ready for any visit. Baptized and confirmed, she was always strong in her Lutheran faith and attended West Denmark Lutheran Church in Luck, where she enjoyed volunteering and fellowship with others. She was preceded in death by her parents, Uffa and Edith Jensen; husband, Alfred Sorensen; sister and brother in-law, Shirley and Bob Behling; and brother, Russell Jensen. Dorothy is survived by her children, Darlene (Dennis) Johnson and Dianna (Daryl) Lidberg; grandchildren, Matthew (Colleen) Johnson, Michelle (Ryan) Taylor, Joseph (Sarah) Johnson, Melissa Lidberg, Christopher Lidberg, Daniel (Rene) Lidberg and David (Alicia) Lidberg; her great-grandchildren, Garrett, Logan, Evan, Blake, Selene, Adelle, Paige, Colton, Ava, Ella and Cora; nieces, nephews, other relatives and friends. A Celebration of Life for family and friends will take place at 11 a.m. Tuesday, April 16, at West Denmark Lutheran Church in Luck, Wisconsin. Visitation will be one hour prior at the church. She will be laid to rest at Milltown Cemetery, Milltown, Wisconsin. Arrangements are entrusted to Rowe Funeral Home, 715-472-2444.